rare Duck... striking appearance... a Lough Allen specilaity! Location: Corry Strand and Point. 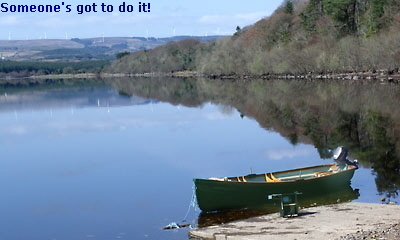 The day was very fine and sunny, and the water surface on Lough Allen was smooth and clear. It was a perfect day for a boat survey. Our plan for the day was to use our Echo sounder, as a tool for the Bird Breeding survey, to record the depth of the lake at fixed positions and to relate this to feeding locations of the local fish eating Duck, the Red-breasted Merganser. Also, to record other birds seen such as Common Gull and Lapwing. On driving down the road to Corry beach, we spotted a pair of Mergansers swimming in the bay, near the shoreline. We managed to take a couple of quick photographs through the car window before they headed off eastwards. Conditions were perfect, and their colours stood out really well. Pity we weren’t a bit closer, but these birds are hard to snap! Over the past couple of years, we have seen Mergansers around the lake, and have also noticed that they are breeding. However, their brood numbers seem to be small. This year, we decided to start looking for them early in the season, to try and find out where they are nesting, and to find out how successful their breeding is. Small breeding numbers and small brood sizes might indicate that while the birds find the area suitable some other factor is working against them, e.g. rising Summer water levels? The first eggs are laid at the end of April, but the main season is May and early June, with an incubation period of 31-32 days. 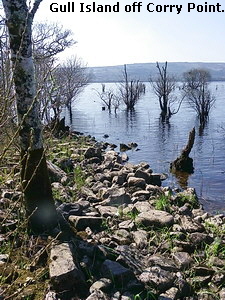 There are plenty of suitable nesting areas around Lough Allen, as they like to nest among tree and scrub roots, but Mergansers nest very close to water so can fall victim to fluctuating lake levels. We have often seen Mergansers in the Corry Strand and Diffagher river area. Today, the Merganser pair covered a large area of the north end of the lake We saw them on many occasions during a two hour period; they move along quite rapidly. They also appear to be actively fishing in about 5-10 meters of water at the North end of the lake. Could they be feeding on the rare shrimp (Mysis relicta) recently discovered for the lake? The lake bottom showing quite a depth of mud. For much of our trip today, we were getting depths of 2 to 3 metres, but towards the islands off Corry Point it was 5 to 6 meters. For much of the area surveyed, the bottom was flat, with quite a depth of mud. Occasionally, a deeper hole, or trench appeared. Only in deeper water (5 or 6 meters) did we see occasional fish echoes, and these were generally quite small. (c. 4-6 inches). We hope to make a map of the lake depths, eventually, when we cover more of the area, weather permitting! 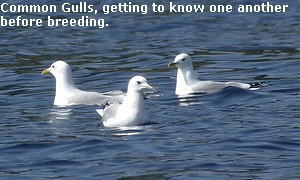 Common Gulls, an attractive dainty unusual Gull, occur in small numbers on Lough Allen! This is significant as, despite their name, they are not the typical ubiquitous Gull seen all around Ireland. They are a small Gull with a typical ‘mewing’ call like one sometimes used to see following a plough. There was a group of three to five just off Corry strand as we headed out in the boat. We noticed that two of these gulls were swimming close to one another and ‘nodding’ rhythmically in what looked like a greeting or courtship display. Common Gulls have shown an increase in the past hundred years but now may be declining; in Ireland, there were 7900 pairs in 1969/70, and 3600 pairs in 1985/87. Of these, 2700 were inland. Common gulls are found both on coastal areas and inland. In Ireland and Britain, Common Gulls seldom migrate little, but make extensive internal dispersals. These are mainly to the south and south west in Autumn, Scottish birds often reaching the Irish sea and Ireland. Egg laying begins in early May, but mainly occurs in the second half of May to June. The nest site varies; can be on ground in low vegetation, on grassy or rocky slope, or on stump or fork of bush or low tree. There are a number of tiny half-submerged little islands in this area of the lake, and we saw about five more Common gulls in all, on these islands. These birds seem to be arriving into their breeding area by moving up from the south where they have recenly been active in the Drumshanbo area, particularly feeding in fields which have been recently spread with slurry! It is anticipated that many more with arrive at their nesting ground at the north of the lake before the egg-laying season. As these birds are neither ‘common’ or widely dispersed, their presence on Lough Allen is significant and we should take steps to see they survive. We saw about five or six Lesser Black Backed Gulls, mainly around the small island off Corry Point. This was about 30m by 15m in size.. Main trees are Alder, though quite a number of young Ash trees were growing in the centre of the island. The substratum is stony but with a fair amount of soil and some plant growth (Lesser Celandine). It’s possible that islands like this could support the growth of Irish Lady’s Tresses, as they are not far from the ‘mainland‘ where Spiranthes have been found? We will be keeping an eye on islands this year, weather and water levels permitting.